We’re in the middle of summer, and that means more time spent out on the lake on your boat dock. But, if you live on a lake and don’t have a dock, or your dock needs maintenance of any kind, then Docks Unlimited is here to help you. With experienced staff who love being on the lake, you can be sure that Docks Unlimited will give you the best customer service and care. If you need a dock installed on your lake or want to replace your current dock, then Docks Unlimited has options for you. An aluminum dock will give you a lightweight, sturdy, and corrosion-resistant dock that will last for years. 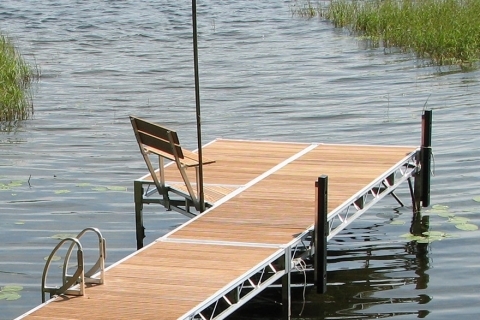 If you’re in an area that’s prone to fluctuating water levels, then floating docks will give you the usable dock you need as they won’t submerge. With a vinyl dock, you get a slip-resistant dock with a chevron flow through pattern, making it easy to take care of water on your dock. For an affordable material that is visually appealing, wood docks are the best choice. No matter which you decide on, Docks Unlimited will make sure the design meets your needs and installation goes smoothly. Once you’ve decided on the type of dock that you want, we can also assist you in your installation. If you schedule an appointment with your professional dock installers, we can show up and install your dock, even if you’re not able to be present! No matter what type of help you need with lake docks, Docks Unlimited has the experience you need. With boat docks, boat lifts, and lake accessories, Docks Unlimited is the go-to place for lake lovers in need of any products and services. With multiple locations and a dedicated staff, Docks Unlimited is ready to help you with all of your lake needs.